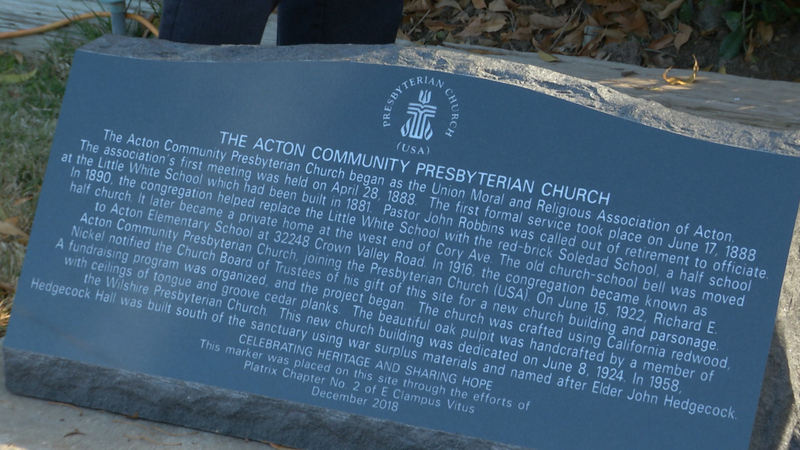 Celebrating the 130th year of the Acton Community Presbyterian Church, the Platrix Chapter 2 of E Clampus Vitus has created and installed a historical marker at the site of the church. The plaque provies the history of the Union Moral and Religioius Society, the Acton Community Presbyterian Church, the Little White School, the red brick Soledad School, and the school-church bell that resides at the Acton school. The church originated as the Union Moral and Religious Assocation of Acton in 1888.